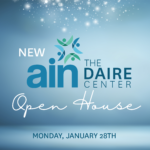 Please join us for the Open House for our new Daire Center, Monday, January 28, 2019. Come and go between 5:00 – 7:30 pm. Light refreshments will be served.